Chemical peel is the most popular and common non-invasive cosmetic procedure done since the 18 th century. The earliest use of caustic preparations for peeling procedures was described in the Egyptian medicine in the Ebers papyrus as early as 1550 BC. , Dermatologists began to show interest in peeling in the 19 th century. In 1874 in Vienna, the dermatologist Ferdinand von Hebra used the technique to treat melasma, Addison's disease, and freckles. In 1882 in Hamburg, Paul G. Unna described the actions of salicylic acid, resorcinol, trichloroacetic acid (TCA), and phenol on the skin. During the first half of the 20 th century, phenol and TCA were used in several centers. Alpha-hydroxy acids (AHAs) became available as superficial peeling agents in late 1980s and the 1990s. AHAs are used in treating aging skin, melasma, photoaging and acne. They are classified as superficial, medium, and deep peels. The superficial chemical peels are very safe when used properly but can cause itching, erythema, increased skin sensitivity, epidermolysis, allergic and irritant contact dermatitis, and post-inflammatory hyperpigmentation (PIH). All peels can cause activation of herpes viral infection, whereas medium and deep peels can cause scarring. Deep peels are no longer popular in Indian skin. They can cause milia, secondary infection, and scarring. Based on the time of onset, complications can be immediate or delayed. Usually, complications are minor and are more common in dark-skinned individuals. They are seen more in medium and deep depth peels. Pain and burning is commonly encountered during a peel procedure in sensitive skin. It can persist up to 2-5 days after the peel till re-epithelialization is completed. It is characterized by the skin remaining erythematous beyond what is normal for an individual peel. Erythema disappears normally in 3-5 days in superficial peel, 15-30 days in medium peel,  and 60-90 days in deep peel. Erythema persisting beyond the above-mentioned time is abnormal and is an alarming sign. It is a predictor of potential scarring. It is due to angiogenic factors stimulating vasodilation which indicates that the phase of fibroplasia is being stimulated for a prolonged period of time. Hence, it can be accompanied by skin thickening and scarring. Pulsed dye laser to treat the vascular factors. If erythema with pruritus or burning or stinging, rule out active infection or flaring of an underlying skin condition. It is more common in younger patients with loose periorbital skin and around eyes. Deeper peels, especially AHAs, can cause epidermolysis, vesiculation, and blistering especially in the sensitive areas such as nasolabial fold and perioral area. TCA 50% and glycolic acid 70% can cause blistering [Figure 1]. The nasolabial folds, inner canthus of the eye, and corners of the mouth should be protected with petroleum jelly. Accidental spillage of any chemical peel agents in the eyes can cause eye injuries in the form of corneal damage. In cases of accidental spillage, the eyes should be flushed copiously with normal saline to prevent corneal damage. If phenol peels have been used, flushing should be done with mineral oil instead of saline. Referral to an ophthalmologist should be done. Peeling agents should not be passed over the eyes. Most of the time the process is self-limiting and corrects spontaneously or with conservative care. Be cautious when using phenol in the periorbital area to avoid burning in the eye. With resorcinol combinations, TCA, or phenol formulas, evaporation of the alcohol or water vehicle base can occur, inadvertently producing a stronger solution. They are rare in TCA and phenol peels since these peels are bactericidal. Prolonged application of biosynthetic membranes or thick occlusive ointments and poor wound care. Ulceration, superficial erosions, crusting, and discharge. Systemic anti-fungals (fluconozole, 50 mg/day). It is characterized by reactivation of herpes simplex on face and perioral area presenting as sudden appearance of grouped erosions associated with pain. Patients with a positive history of herpes simplex should be given 400 mg of acyclovir three times a day beginning on the day of the peel and continuing for 7-14 days, depending on whether it is a medium depth or deep chemical peel. Few recommend acyclovir 200 mg five times a day or valaciclovir, 1 g times a day starting 2 days before a peel and continued for 14 days. It is preferred to treat all patients with anti-viral agents regardless of a positive history as many patients do not remember prior herpes simplex infection that may have occurred years ago. A negative history of cold sores cannot predict development of post-operative herpes simplex virus infection after a procedure. ,[11 ] Since all anti-viral agents inhibit viral replication in the intact epidermal cell, the drug would not have an inhibitory effect until the skin is re-epithelialized, which is 7-10 days in medium and deep peels. In the past, these agents were discontinued at 5 days and in these patients, clinical infection became apparent in 7-10 days. Frequent post-operative visits should be done so that it can be ensured that appropriate home wound care is being performed and to minimize the risk of infection. Avoid occlusive dressing in the immediate post-operative period because of its propensity to promote folliculitis and streptococcal and staphylococcal infections. Change of contact agents or protection with a biosynthetic membrane. Daily dressing along with a close watch on healing skin is a must. Hypopigmenting agents (hydroquinone, kojic acid, and arbutin) should be strictly enforced in the post-peel period too. Triple combinations of hydroquinone, tretinoin, and steroids should be started once re-epithelialization is completed. 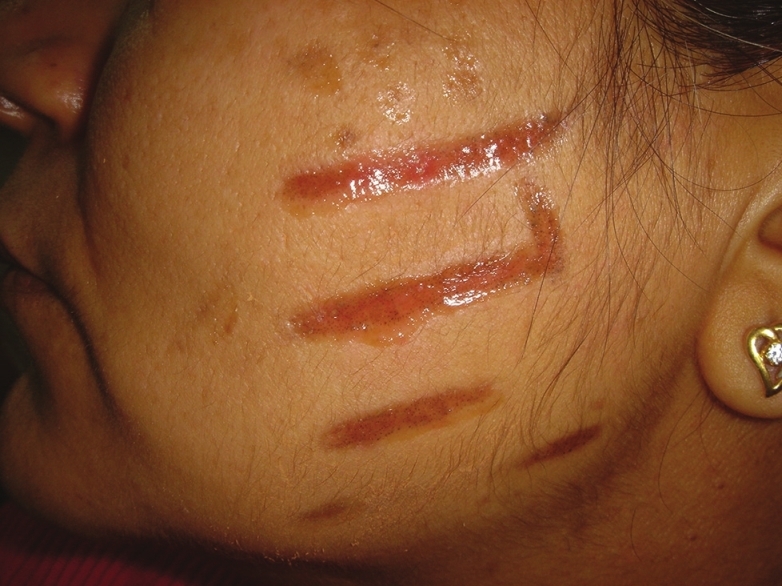 Transient lighter complexion is seen due to sloughing off of the epidermis and removal of excess melanin. Especially with 50% TCA and phenol peels. It can occur any time after a peel and can be persistent, if treated inadequately. It is the most common complication of TCA peeling. 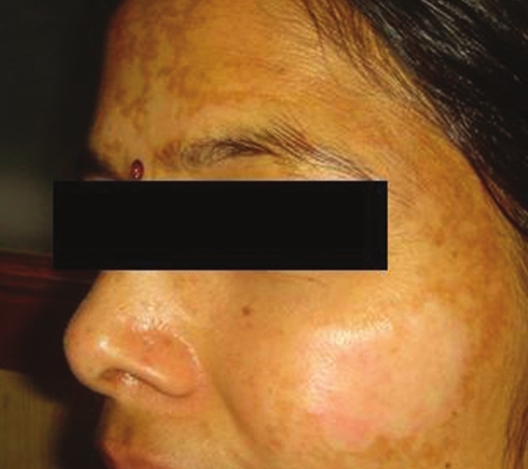 Complications from superficial peels are limited to transient hyperpigmentation or dyschromia especially in dark-skinned patients. With medium depth peels, irregular pigmentation can occur. Temporary accentuation of lentigines and nevi may also occur because the existing sun damage has been cleared. Patients should be warned that lesions like solar lentigines may initially disappear and then return after chemical peel. This occurs because the melanocytes that are responsible for pigmentation reside below the level of chemical peel [Figure 3]. Use of photosensitizing agents such as Non steroidal anti-inflammatory drugs, oral contraceptives, etc. Use of sunscreen with Sun protection factor 30. In some cases, a superficial peel (glycolic acid, 30-40%) is used to hasten resolution. Good skin care regimens can sustain more long-lasting results though studies have shown that peeled skin returns to its baseline status within 2-6 months without maintenance therapy. Cessation of use of birth pills during peripeel period because it may invoke pigmentary changes. Incorporate broad spectrum sunscreens/bleaching agents (hydroquinone, kojic acid, arbutin)/retinoids/AHAs and beta-hydroxy acids/other anti-oxidant cosmeceuticals and bleaching creams singly or in combination as post-peel skin care regime. Bleaching effect can be seen after phenol peels. It is often noticed in the jaw neck region where untreated skin in the neck appears more obvious as it abuts the newly rejuvenated cheek or periorbital skin. This appearance may be desired in some but in patients undergoing regional facial peeling, this bleaching may become noticeable and troublesome. It is due to melanocytes losing their function to produce melanin. These are seen in medium and deep depth peels in darker skin types. They can be prevented by feathering edges using peeling agents of lower concentrations to merge with surrounding normal skin. These are inclusion cysts which appear as a part of the healing process and are more common with dermabrasion than chemical peels. It is usually seen during the first few weeks of the recovery period. The post-peel care of deeper peeling may cause milia by occluding the upper pilosebaceous units with ointments. Thicker-skinned patients have been said to be in greater risk. Milia often resolve spontaneously with normal cleansing of the face. Sometimes, extraction or gentle electrodessication is effective. Returning to gentle epidermabrasion after re-epithelialization or the use of tretinoin both before and after peeling may retard their appearance. Temporary appearance of enlarged pores post-peel can occur due to removal of stratum corneum. If the wounding agent is not capable of peeling below the defect, lacks the surfactant to provide an even depth of wounding, or has a very high surface tension, then uneven results will be produced from the selection of this inadequate wounding agent to peel below defect depth. 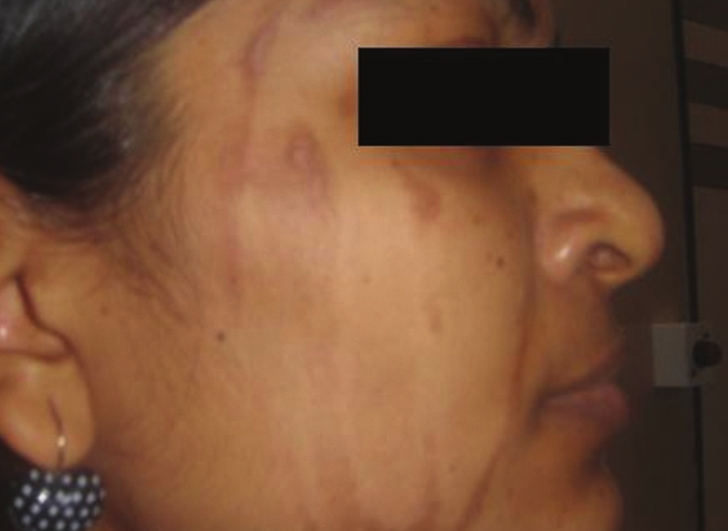 Patients with telangiectasias may notice a worsening after phenol peeling which can be treated with vascular lasers. Past history of keloids/hypertrophic scars. Thin-skinned patients are more prone for scarring because the TCA is more likely to penetrate deep into the reticular dermis. Phenol peels can cause cardiac, renal, and pulmonary toxicities. The best management of these complications is to avoid them. In patients deliberately face peeled with phenol in 30-min time, tachycardia was usually noted first followed by premature ventricular contractions, bigeminy, paroxysmal atrial tachycardia, and ventricular tachycardia. Some progressed to atrial fibrillation, , Resorcinol resembles phenol in its systemic actions. Theoretically, similar complications might be induced if painted over one-third of body surface. A 40% peeling resorcinol paste applied daily for 3 weeks produced dizziness, pallor, cold sweat, tremors, and collapse on final application. , Resorcinol has an anti-thyroid activity. Hence, continuous application can cause myxedema. Repeated applications should be applied with caution in low body weight patients. Stridor, hoarseness, and tachypnea have been reported developing within 24 h of phenol peeling. It may be due to hypersensitivity reaction in a larynx already chronically irritated by cigarette smoke and may resolve with warm mist therapy. Anti-histamines prior to peel may prevent this. Cardiac monitoring to detect any electrocardiography abnormality (premature ventricular contraction/premature atrial contractions). In such cases, the procedure should be halted. In a series of full face phenol peels, the incidence of cardiac arrhythmias was 6.6%. Intraoperative oxygen to prevent arrhythmias. Allergic contact dermatitis is more common with resorcinol, salicylic acid, kojic acid, lactic acid, hydroquinone, etc. Irritant contact dermatitis can be caused by glycolic acid. Any peel can cause irritant dermatitis when used with excessive frequency, inappropriate high concentration, and vigorous skin preparation using acetone or another degreasing solution. The complications of superficial and medium deep peels are summarized below [Table 1]. Chemical peels represent a flexible and useful tool for improving skin texture and the effects of ageing. The level of expertise of a dermatologist is crucial for the rate of side-effects and for the final peel results. Superficial peels are easy to perform and their complications are rare if appropriate pre-peel and post-peel care is taken. 1. Brody HJ, Monheit GD, Resnik SS, Alt TH. A history of chemical peeling. Dermatol Surg 2000;26:405-9. 2. Major RH. The papyrus Ebers. New York: Hoeber; 1930. 4. Monheit GD. Chemical peels. Skin Therapy Lett 2004;9:6-11. 5. Anitha B. Prevention of complications in chemical peeling. J Cutan Aesthet Surg 2010;3:186-8. 6. Uday K, Sushil P, Nischal K. Sunscreens. In: Handbook of Dermatological Drug Therapy. 1 st ed. New Delhi: Elsevier; 2007. p. 299-304. 7. Spira M, Gerow FJ, Hardy SB. Complications of chemical face peeling. Plast Reconstr Surg 1974;54:397-403. 8. Khunger N. Vedamurty M, Arsiwala S. Complications. In: Step by Step Chemical Peels. 1 st ed. New Delhi: Jaypee Medical Publishers; 2009. p. 279-97. 9. Mendelsohn JE. Update on chemical peels. Otolaryngol Clin North Am 2002;35:1: p-55-71. 10. Singh-Behl D, Tung R. Chemical peels In: Cosmetic Dermatology. Vol. 1. 1 st ed. Saunders, Philadelphia: Elsevier; 2008. p. 97. 11. Rapaport MJ, Kamer F. Exacerbation of facial herpes simplex after phenolic face peels. J Dermatol Surg Oncol 1984;10:57-8. 12. McCollough EG, Langston PR. Dermabrasion and chemical peel: A guide for facial plastic surgeons. New York: Thieme Medical Publishers; 1988. p. 43-54n. 13. Sperber PA. Chemexfoliation for aging skin and acne scarring. Arch Otolaryngol 1965;81:278-83. 14. Hernandez-Perez E, Khawaja HA, Alvarez TY. Oral isotretinoin as part of the treatment of cutaneous aging. Dermatol Surg 2000;26:649-52. 15. Singh-Behl D, Tung R. Chemical peels In: Alam M, Gladstone H, editors. Cosmetic Dermatology. Vol. 1. Murad Alam; Hayes Gladstone. p. 83. 16. Gross BG. Cardiac arrhythmias during phenol face peeling. Plast Reconstr Surg 1984;73:590-4. 18. Pascher F. Systemic reactions to topically applied drugs. Howard Fox memorial lecture. Bull N Y Acad Med 1973;49:613-27. 19. Dmytryshyn JR, Gribble MJ, Kassen BO. Chemical face peel complicated by toxic shock syndrome. A case report. Arch Otolaryngol 1983;109:170-1. 20. LoVerme WE, Drapkin MS, Courtiss EH, Wilson RM. Toxic shock syndrome after chemical face peel. Plast Reconstr Surg 1987;80:115-8. 21. Beeson WH. The importance of cardiac monitoring in superficial and deep chemical peeling. J Dermatol Surg Oncol 1987;13:949-50. 22. Fischer TC, Perosino E, Poli F, Viera MS, Dreno B, Cosmetic Dermatology European Expert Group. Chemical peels in aesthetic dermatology: An update 2009. J Eur Acad Dermatol Venereol 2010;24:281-92.